This is one for Nicola, she is the Whisky Boys photographer and owns quite an up market Nikon with all the bits and pieces, so who knows maybe sometime in the future Nicola may attend the ceremony as a winner, but at the moment she will not give up her day job. By supporting the Awards for the next three years, The Macallan will cement its growing commitment to the photographic wo rld as well as working in partnership with The Society to develop the Awards in the longer term. Membership of the Society is diverse and varied across both professional and amateur spectrums enabling The Macallan to play its part in encouraging the rich seam of talent, expertise and innovation of photographers, educationalists, and imaging scientists. The Royal Photographic Society Awards: awarded annually to individuals who have made significant contributions to the art and science of photography. Nominations are invited for a wide range of awards, including to those under the age of 35. The Spiritual Home: Easter Elchies House proudly watches over The Macallan distillery in Speyside, Scotland. Built in 1700, this Jacobean manor house is The Macallan’s spiritual home. Curiously Small Stills: The Macallan’s curiously small and uniquely shaped copper stills help to concentrate the flavour of the ‘new make’ spirit. The Finest Cut: The ‘cut’ is the amount of distilled spirit collected from the stills as ‘new make’ spirit. The Macallan takes one of the ﬁnest ‘cuts’ of any distillery in Scotland; typically just 16% goes forward to fill or our casks. Exceptional Oak Casks: The Macallan’s unfaltering obsession with selecting exceptional oak casks brings an unsurpassed, timeless quality to The Macallan. Natural Colour: The Macallan insists upon Natural Colour. It is the interaction of spirit and wood alone which delivers the rich variety of colour, aroma and taste evident through out the range. 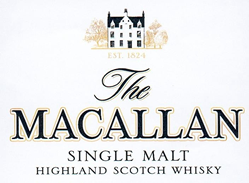 Peerless Spirit: The Macallan remains the single malt against which all others must be judged. It is celebrated far and wide by experts and discerning drinkers as the world’s most precious whisky.